Now, it’s well-documented that this error will show up if one hasn’t configured IP Pools as part of the vC Ops setup but in my case, it existed. It was clearly working before the shut down! 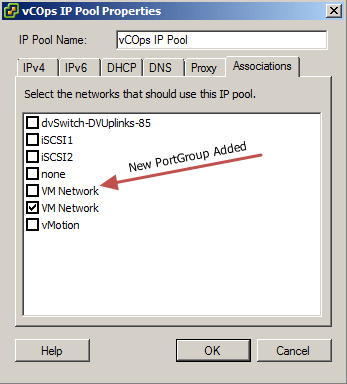 This was obviously from the new cluster but why should it try to look at the unticked “VM Network” in preference to the one already ticked, covered and working, is still beyond me. However, ticking the box fixed the problem. For the sake of completeness, this happened in my vSphere 5.5 lab and looks like a bug to me. Hopefully, it will be fixed soon but just wanted to quickly document it in case someone else hits the same problem.